Give almost any child in the world a pencil and paper - and ask them to draw a person, the chances are they'll sketch a stick figure. Recognising this simple fact led Zing Toys to create the versatile StikBot range of toys. This collection was one of the stand-out products from the London 2016 Toy Fair and was the winner of the ‘Best New Toy in the Pocket Money Category’. These cleverly designed articulated toy figures perfectly mimic almost any human action like stretching, bending, walking and running. The torso, neck and limbs are specially designed to be able to re-create any posture. Tiny suckers on the feet and hands enables StikBots to be temporarily positioned in almost any pose you want! Stick them on glass windows, ceilings or walls and even them stick them together in ridiculous postures! Described as 'The 1st social media sharing toy', kids can create their own stop-motion videos on their smart phones by downloading the free app from the iOS or Android stores. By filming with a plain green screen background, children can then overlay their creation onto a background of their choice. This can be a moon-scape, urban street, park, beach or field scene - or anything else they can imagine. 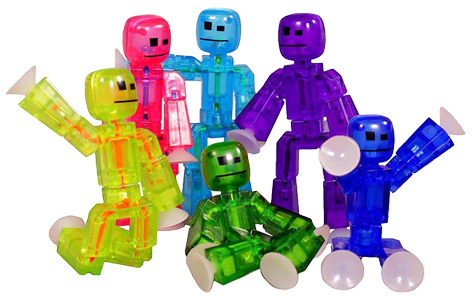 Supplied in the UK by Brainstorm, StikBot figures can be purchased in a variety of colours and designs. Upload your finished creation to your favourite social media website and share with friends and family. Ideal for children of 4 years and over, these toys encourage imagination and role play combined with a modern digital element. Please tell us what you think of the StikBots by Brainstorm.